The lots-to-prove Dallas Cowboys may not be ready for prime-time in the 2009 season. But Jerry's Palace is. NBC's Sunday Night Football will have the first regular season game from the so-called "Eighth Wonder of the World," with the New York Giants in town as the loyal opposition on Sept. 20th. Cherry-picking marquee games increasingly is a sport within a sport in the NFL. Which means that Dallas-based Fox4 has to swallow hard and accept one fewer Cowboys game than it had last season. 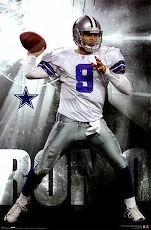 The 2009 schedule also gives NBC a pair of Sunday night games with the Cowboys' two other NFC East rivals. They'll visit Philadelphia in prime-time on Nov. 8th and will be in Washington under the lights on Dec. 27th. Dallas also hosts Carolina Sept. 28th on ESPN's Monday Night Football. And the Cowboys will be at New Orleans Dec. 19th on the NFL Network. 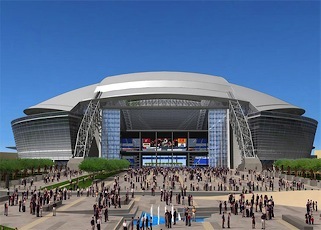 Fox4 won't get to show off the Cowboys' new stadium until the sixth game of the season, on Oct. 25th against Atlanta. The annual Thanksgiving Day game goes to CBS this season, with Oakland in town. CBS also has a Dec. 13th game between the host Cowboys and San Diego. That leaves Fox4 with just nine regular season games, even though its network is home base for the NFL's NFC teams. Split by a bye week, Fox4 will have four consecutive games early in the season, beginning with an Oct. 4th road game against Denver and ending with a Nov. 1st home matchup with Seattle. Fox4 also gets the Cowboys' Sept. 13th season opener at Tampa Bay and the last regular season game on Jan. 3rd, with Philadelphia visiting. But the station will have just two of the Cowboys' six final regular season games, when a post-season spot presumably will be on the line.